Labor day in Baltimore for the past three years has been taken hostage by the Grand Prix race. The race closes over 50% of the roads and, for us locals, can cause a huge headache. Because of this I decided to retreat from my city and trek to another! Lucky for me my boyfriend invited me to Texas with him to visit his friend. 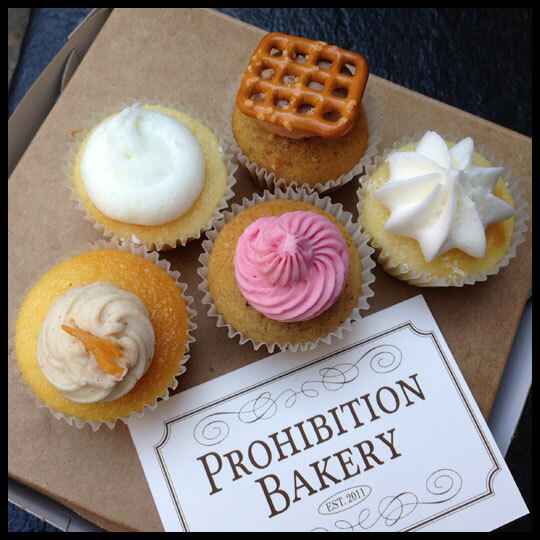 Our itinerary was full, including two cities, and of course cupcakes! 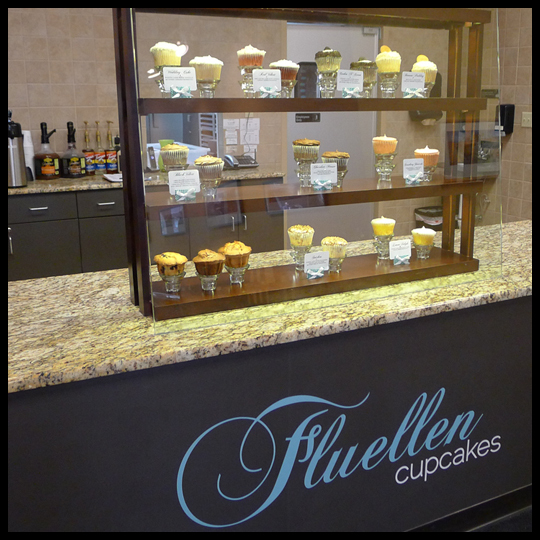 After the museum, I walked to my first cupcake stop, Fluellen Cupcakes on Elm Street. After speaking with the lovely staff, and finding out they had just opened the month before, I chose two flavors to try. 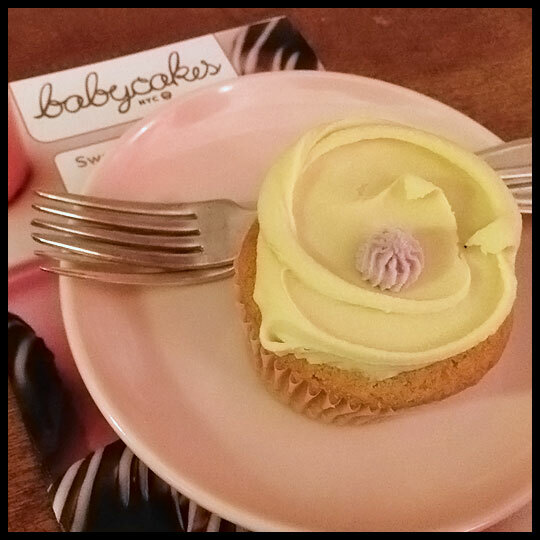 Truly delicious banana cupcakes are an elusive rarity. 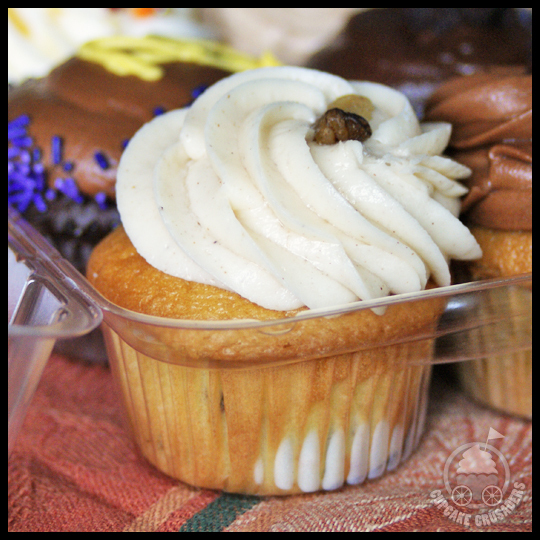 Often banana cupcakes end up with the texture and taste of a muffin, instead of true cake. This cupcake was one of those TRUE banana cupcakes. No muffin here, just a moist, airy, sweet and banana-y cupcake with smooth cream cheese frosting. 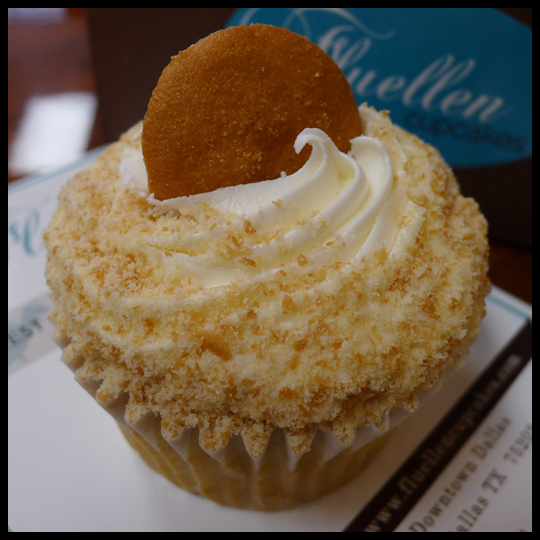 The vanilla wafer on top added a nice crunch, all in all, a fantastic cupcake that is not to be missed. 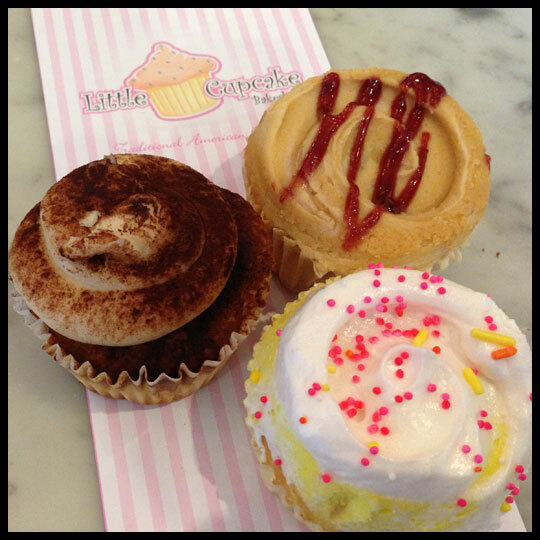 Pink, Pink, Pink… talk about a colorful cupcake! Sweet cake with a subtle strawberry flavor and a strawberry infused cream cheese frosting, topped with a fresh strawberry slice. 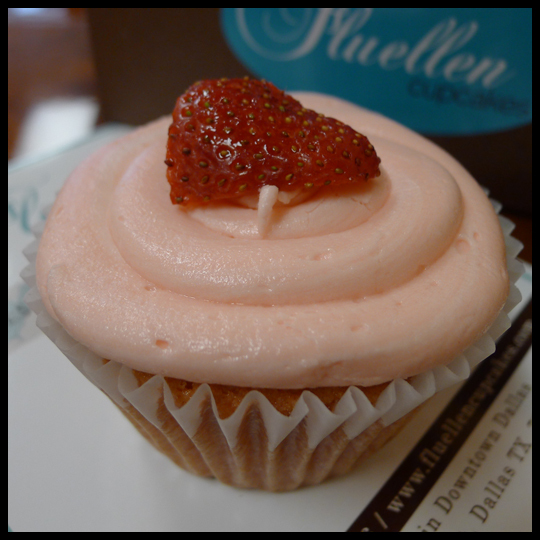 While this isn’t my all-time favorite strawberry cupcake, it is very good and one I wouldn’t mind eating again. 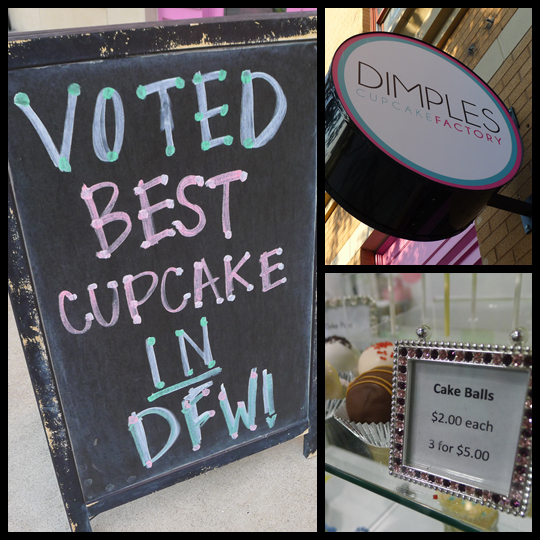 My trek then lead me to Frisco, an area north of the city, where the “best cupcakes in Dallas” live: Dimples Cupcake Factory. After driving 30 minutes, I walked in the adorable shop and realized the cupcakes looked oddly similar to the cupcakes I had just eaten! After confirming with the staff that the baker was indeed the same, I decided not to get more cupcakes, but to instead get cake balls! And wow, was I glad I did! 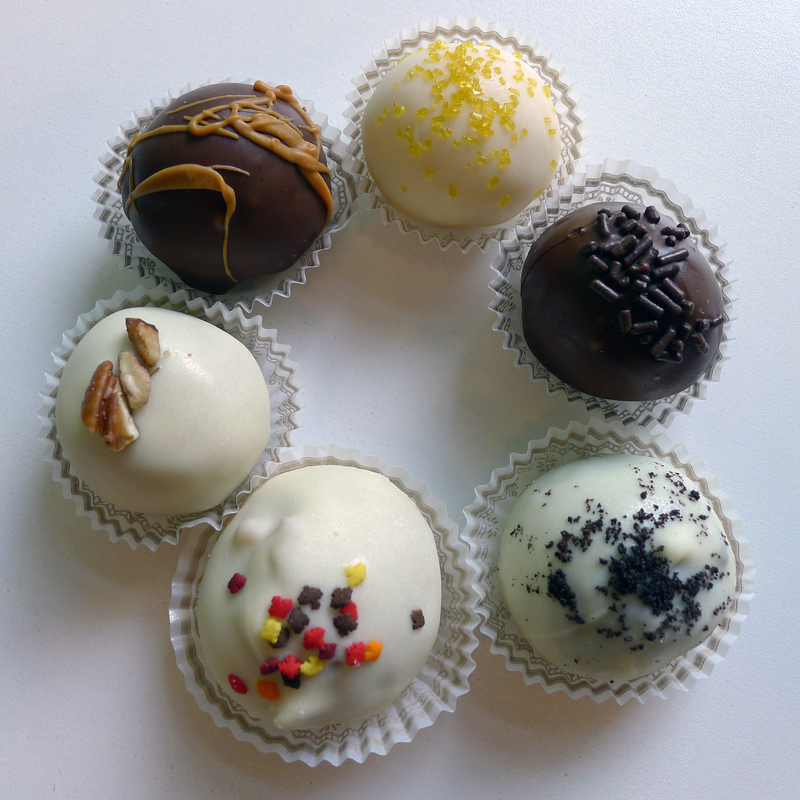 I never thought after eating 6 cake balls, all at one time mind you, I would want more… but I did. 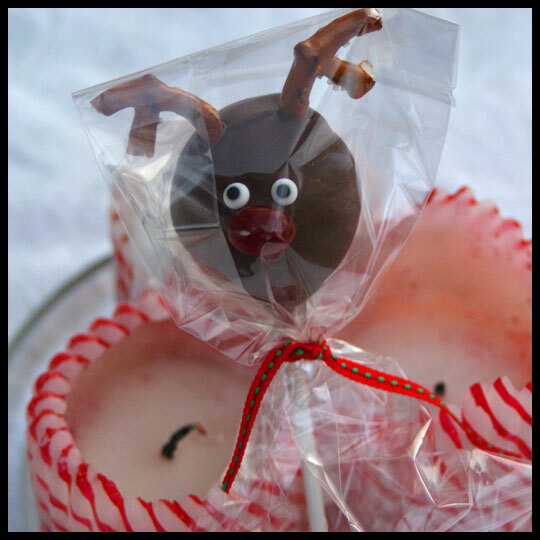 These were amazing. My favorites were Maple and Black Velvet, but all of them were fantastic. 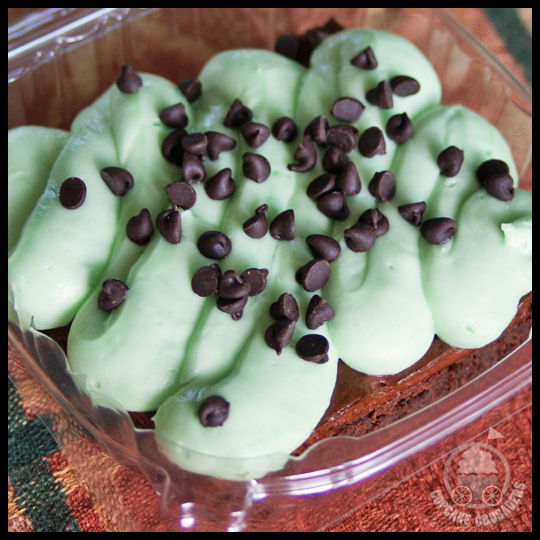 Moist, packed full of flavor, and perfectly sweet, these were by far the best I have ever eaten and made the drive completely worth it! Dallas was warm, welcoming, educational, fun, and the cupcakes were great too. 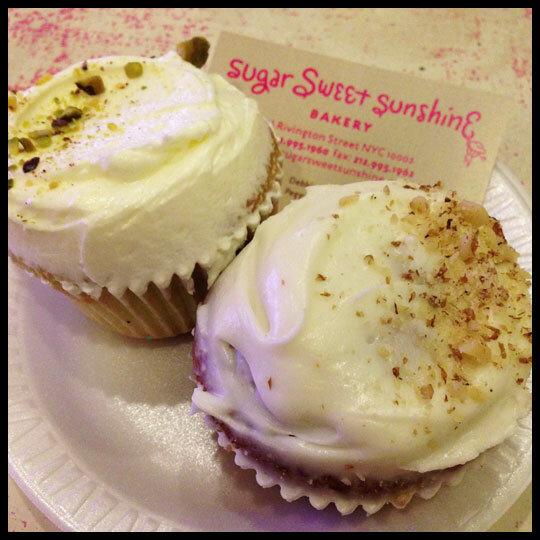 It was hard to imagine I would find cupcakes as good in Austin, the next stop on our trek… but you’ll have to wait until next week to find out! Back in June of 2010 Guest Crusader Jen invited Crusader Stacy and I to help her pick out a wedding dress at the Kleinfeld Bridal in NYC (home to TLC’s Say Yes to the Dress). 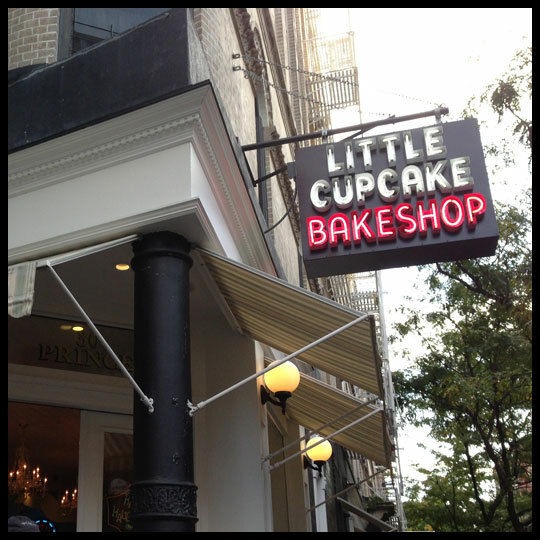 Although Jen lived in the city, this would be a weekend trip for Stacy and I, and a weekend in NYC wouldn’t be complete without cupcakes. 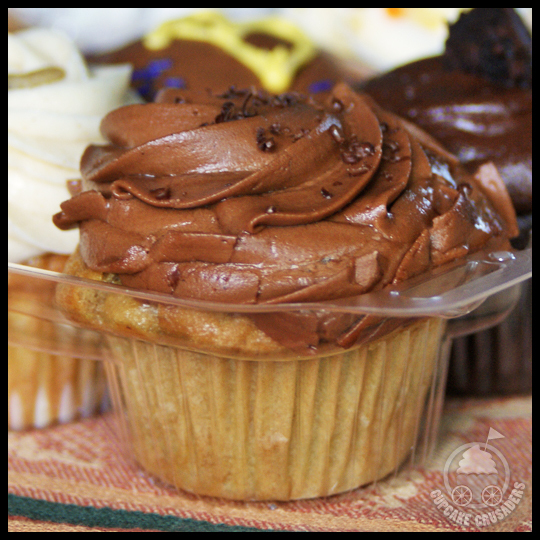 Stacy worked her cupcake research magic and discovered that Cupcake Cafe was conveniently located near our shopping location. Done. After successful dress shopping (Jen said Yes to a Dress! 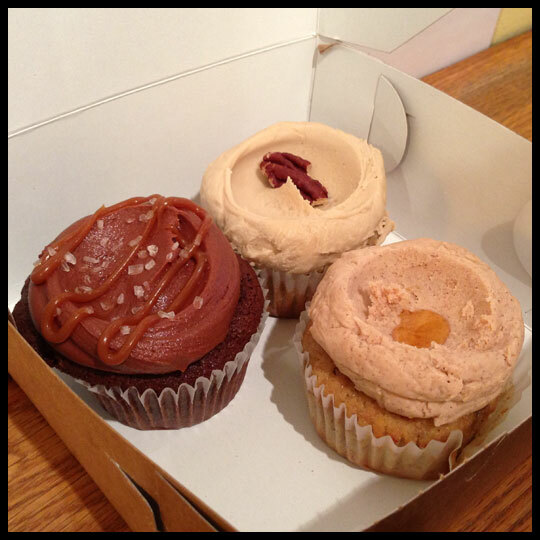 ), we headed over to Cupcake Cafe as a pre-lunch treat. 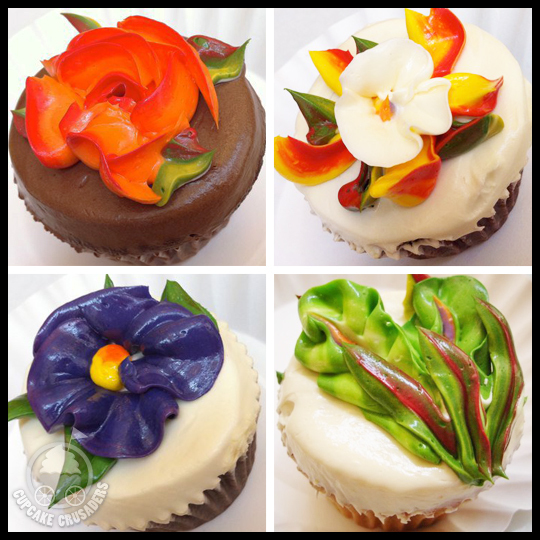 When we entered the shop we were amazed at the flower decorations on the cupcakes, all created with soft buttercream and each one unique. Not only did we pick flavors, but also which design we wanted amongst the selection. 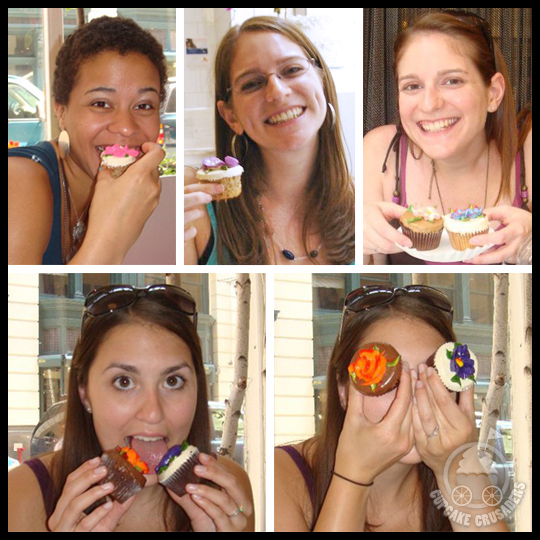 With such beautiful cupcakes, we all took photos and then took turns posing. 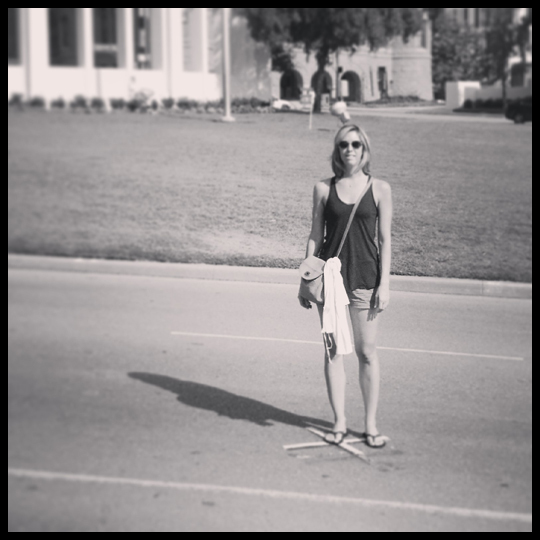 Some of us take our photo ops very seriously, as you can see. 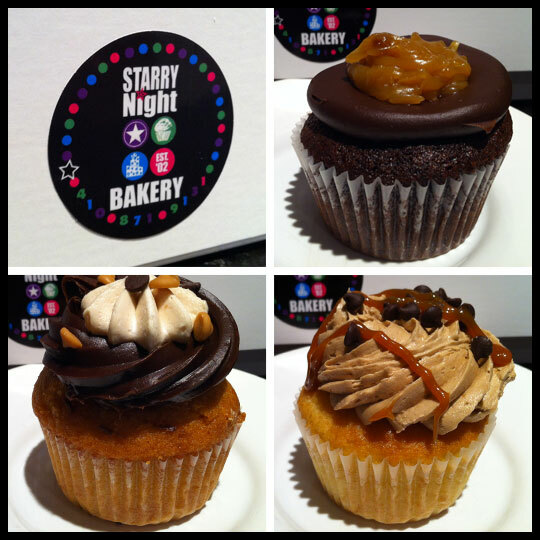 The top right photo is me and my two cupcakes: the Mocha Chocolate and Maple Walnut. I have a long history of not being able to choose just one. My two flavors were standouts, proven by the fact that I still remember them 3 years later. 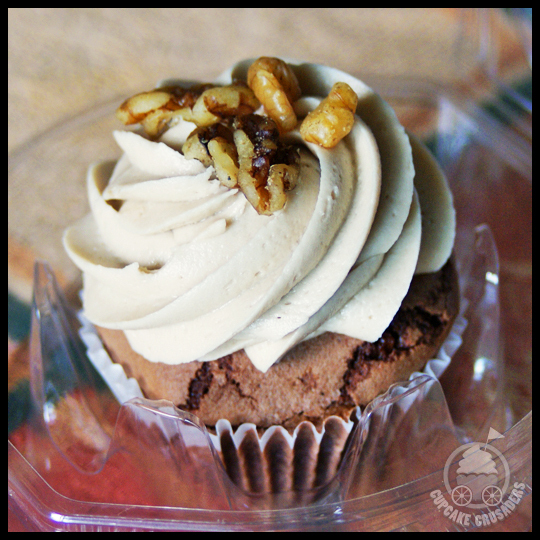 I believe this was one of the first cupcakes I’d ever had that emphasized the “butter” part of “buttercream.” Stacy and I loved the smooth frosting, especially the rich maple buttercream paired with the walnut cake. This cupcake made me realize that frosting doesn’t have to be super sweet in order to be enjoyable. 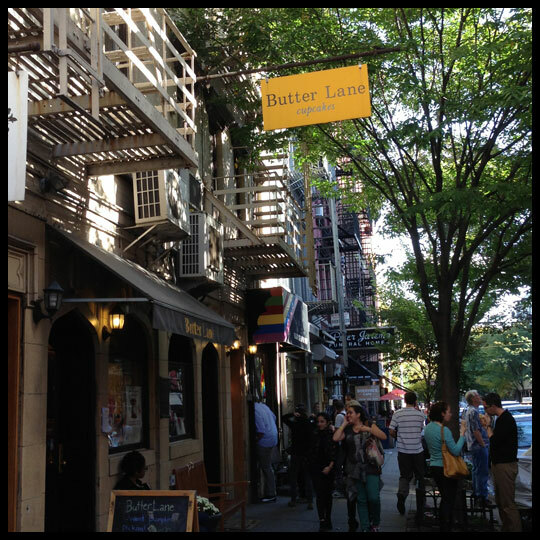 On our visit, the cafe was next to Books of Wonder, near the Flatiron District. That location is now closed, however they still have a shop in Hell’s Kitchen (which is actually more convenient to my usual trips). 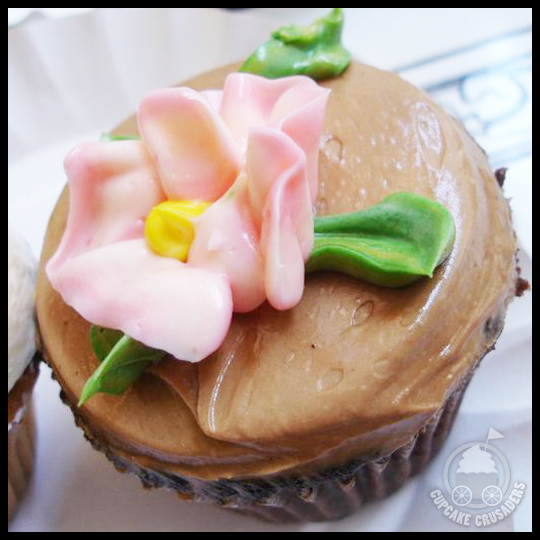 If you prefer less sugar and more butter in your frosting, than definitely give Cupcake Cafe a try! 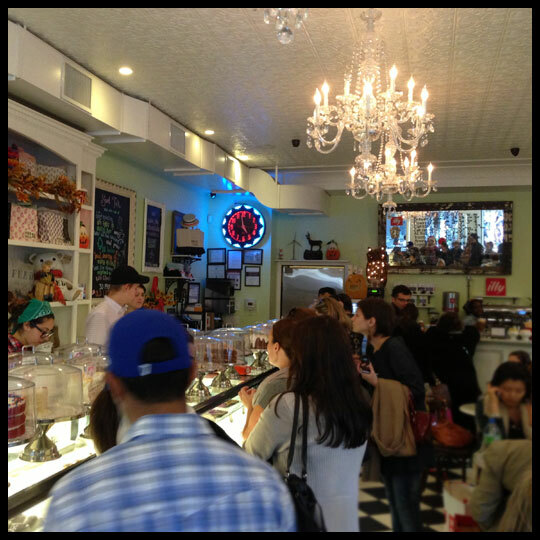 Our NYC friends indulged Stacy and I throughout the weekend, taking us to Serendipity’s and Dylan’s Candy Bar for more sweets. In addition to stuffing our faces with treats, we also spent time at a flea market and found ourselves at the heart of the Gay Pride Parade. Thinking back on the fun we had that weekend is bittersweet. Jen has moved to LA and Liz will be leaving NYC soon as well. 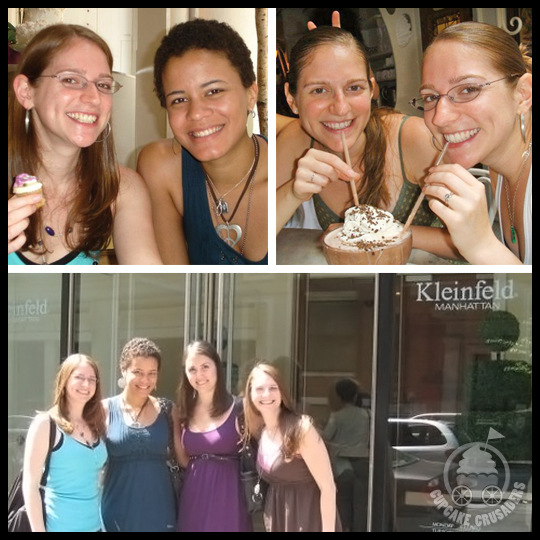 NYC visits won’t be the same without spending time with my girls, but we have some good memories that will always make me smile. 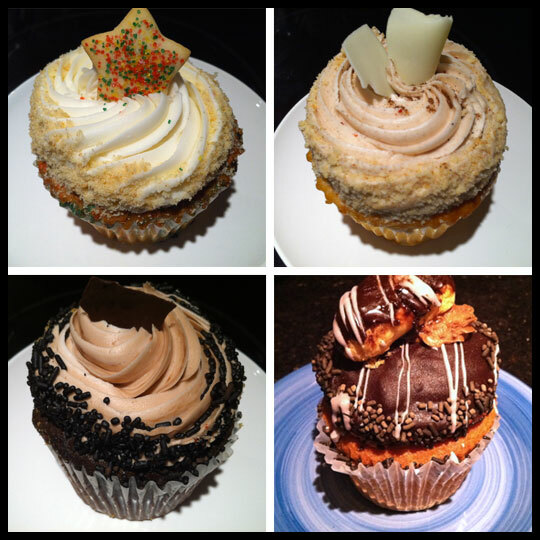 And Jen has promised us some LA cupcake reviews! The Crusaders have been talking about a Philly tour for the past couple of years. Thanks to Crusader Jenn’s reminder and Crusader Stacy’s planning, we finally made it happen this fall for our Annual Cupcake Tour! This year it was just us three Crusaders and Mr. Ross, Jenn and Stacy’s dad. (Thanks to Mr. Ross for driving. He truly is a crusader!) While Crusader Stacy, Mr. Ross and I had all been to the “city of brotherly love” before and love its charm and personality, this was Crusader Jenn’s first time. 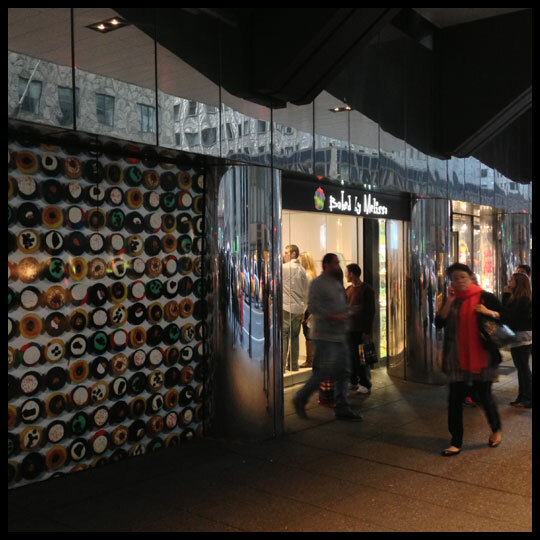 We all couldn’t wait to taste what the cities cupcakes had to offer. We were all excited to get the tour started, and as we walked up to the corner of our first address we realized we were in front of the Reading Market and that the shop must be a part of the market. What a great location! The adorable market shop was busy, as was the rest of the market, but the staff were friendly and kept the line moving quickly. We all ordered one cupcake, and ate them standing. Immediately we all agreed that this was the perfect way to start the day! 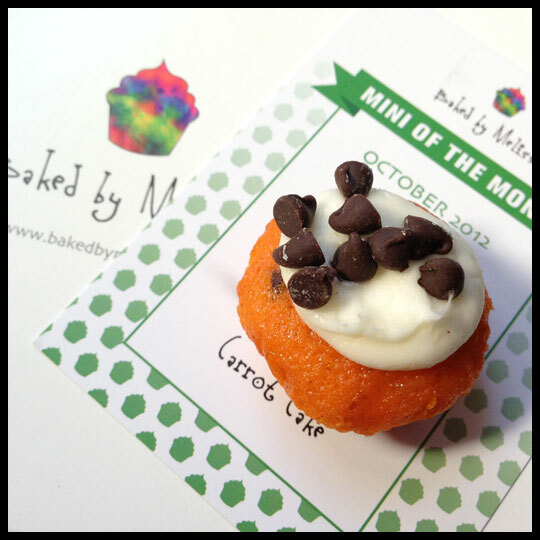 While the flavors were on the light side, they were perfect with the moist cake and buttery frosting. Crusader Stacy really enjoyed the crunchy top of her espresso cupcake; Crusader Jenn liked the moist cake in her apple cinnamon selection; Mr. Ross dove into his chocolate cupcake with gusto and I loved the extra buttery, maple frosting. Philly Cupcake is a quaint little shop on a corner with a take out window, but since it was a cold day, we went inside to peruse their selection and keep warm. Right away the flavor options intrigued and beguiled us, with names like the Massacre and the Coma it’s no wonder we had trouble deciding! This cupcake shop ends up with mixed reviews though, as Crusader Stacy was not all that impressed with her sweet potato marshmallow cupcake, but Crusader Jenn’s “Massacre” cupcake was the best chocolate and peanut butter cupcake she has EVER had. Mr Ross liked his coconut cupcake, as it tasted like a Pina Colada and was light and not too sweet. 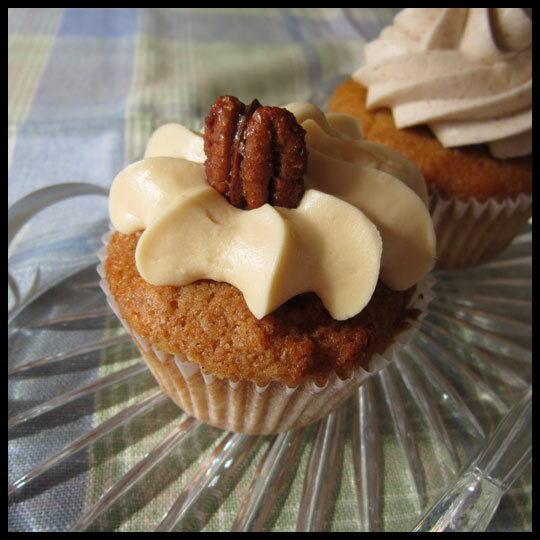 My sweet potato pecan cupcake was the perfect blend of sweet potato pie and pecan pie rolled into one heavenly mixture. It really was an even split, we liked them all, but only thought two (the Massacre and Sweet Potato Pecan) were anything to write home about. 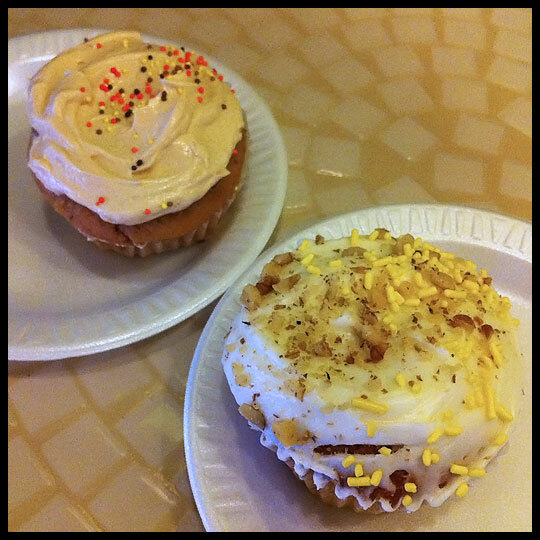 While the lemon and pineapple cupcakes were dense, but overall good, the red velvet was dry and boring. Crusader Stacy thought the pineapple cupcake had really delicious flavor, and while pound cake isn’t her favorite cake it worked in this instance. Crusader Jenn thought the lemon cake was dense and lacked flavor, but the tart frosting was enough to carry the cupcake. Both Crusaders Jenn and Stacy love eggnog cupcakes, so right away we were excited to find this flavor. The spiked eggnog was definitely spiked, with a great blend of eggnog and liquor flavor. The moist cake was sweet and satisfying. 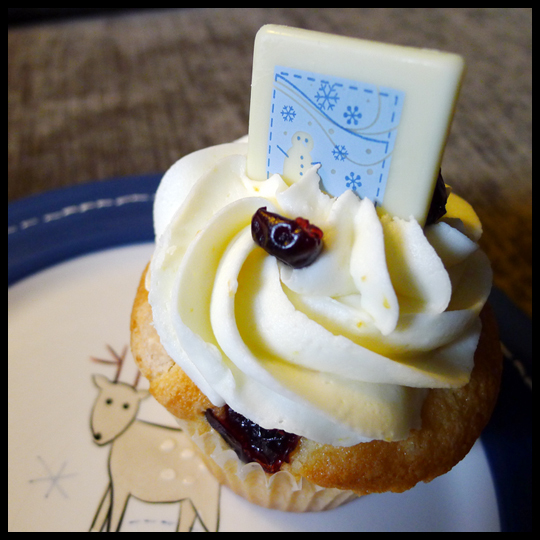 The PB&J cupcake was on the dryer side, but the flavors were amazing. There was a perfect portion of jelly filling and the peanut butter frosting was spot on in both flavor and texture. This would definitely be a spot we would go back to again! 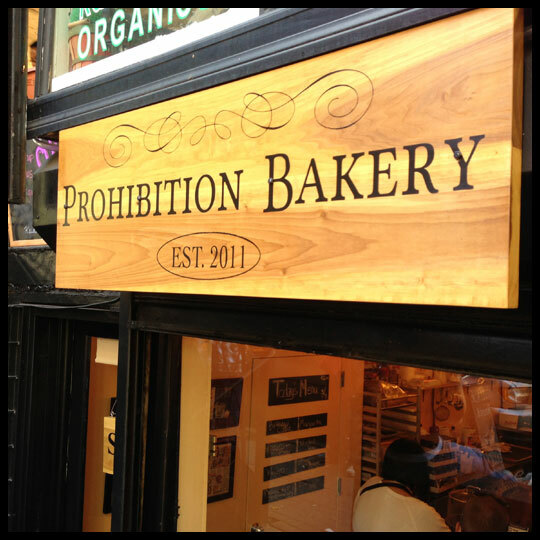 As Philly’s first vegan and gluten free bakery, we commend them on their attempt to make sweet treats without real butter or refined sugar, but sadly our cupcake experience fell short. 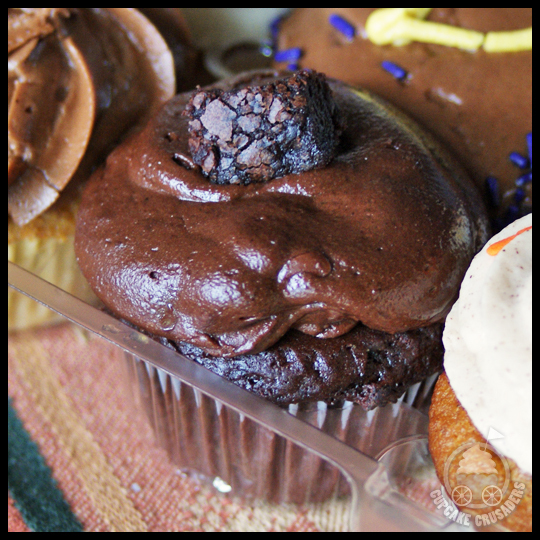 There was really only one word to describe the cupcakes we tried: awful. The Boston creme tasted more like day old stale bread than anything sweet and moist, while the salted caramel chocolate tasted like baked cardboard. They were not large cupcakes, nor were they cheap at $4 per cupcake, but we ended up throwing out most of both. We discussed that perhaps our taste buds are spoiled by real butter, gluten and sugar, and therefore are not the best judges of these particular cupcakes. Just as their website says, J Café really is a hidden gem, located on Main Street in downtown Westminster. Crusader Stacy had mentioned them about a year ago, but I wasn’t sure that they were a regular cupcake-carrying establishment, so I never rushed over there. 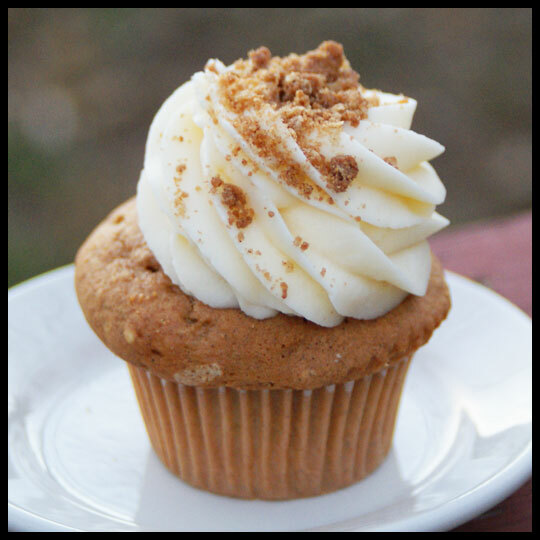 Luckily Stacy reminded me of J Café last week, when they were debuting their seasonal pumpkin cupcake. With no plans for the day, I decided an outing was in order. I’ve probably driven past J Café a hundred times, but its understated exterior blends perfectly with the historic Main Street surroundings. 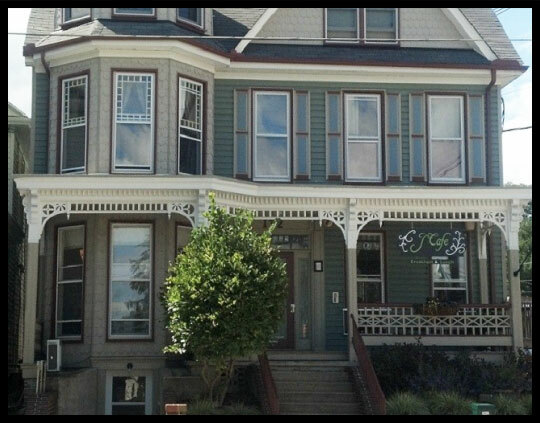 I was glad to see that the interior also mimics the traditional Victorian style, with an open entry way, original plank floors, narrow staircase (for what I’m assuming is residential space on the top floors), and a long hallway that leads to the back, where the “front” counter is. Seating is situated in the two large rooms off either side of the hall. At the counter was a display case that was filled with a respectable selection of cupcakes, particularly for a café that seems to focus on breakfast and lunch. There were probably 6-8 cupcakes to choose from. 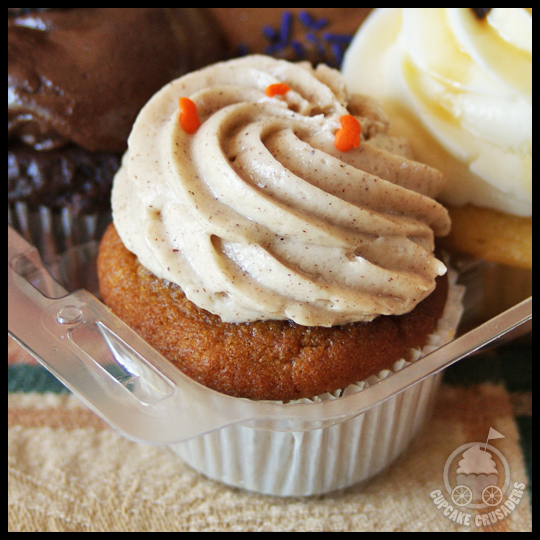 I went with the seasonal Pumpkin Maple cupcake and the Sweet Potato, since it also seemed appropriate for the fall. However, I really want to try the Limoncello! 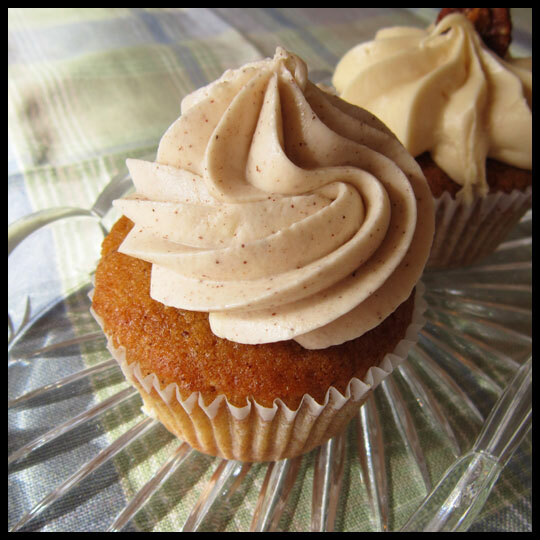 This cupcake had a soft, moist cake, with a buttery, maple-spiced frosting. The flavors were perfectly balanced and Crusader Elisa (the biggest butter lover you’ll ever meet) would have loved it. 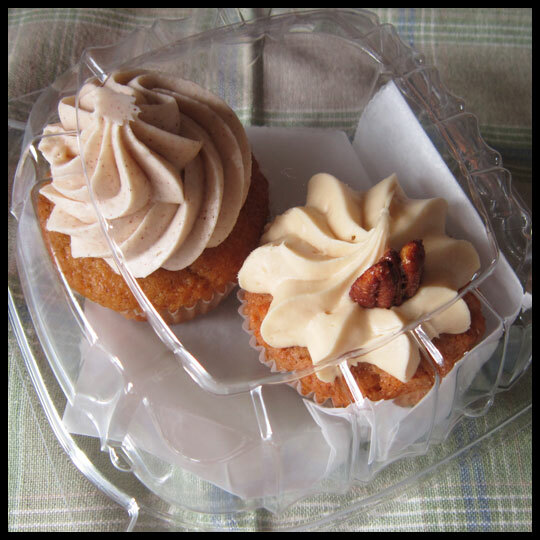 The Sweet Potato cupcake had a salted caramel frosting and was topped with a candied pecan. The cake was soft and moist, just like the pumpkin, but also had pieces of fresh sweet potato. 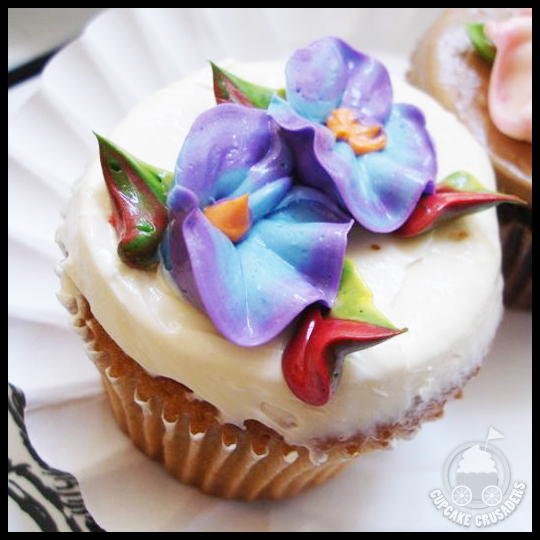 The frosting was also buttery, and balanced the perfect level of sweetness. 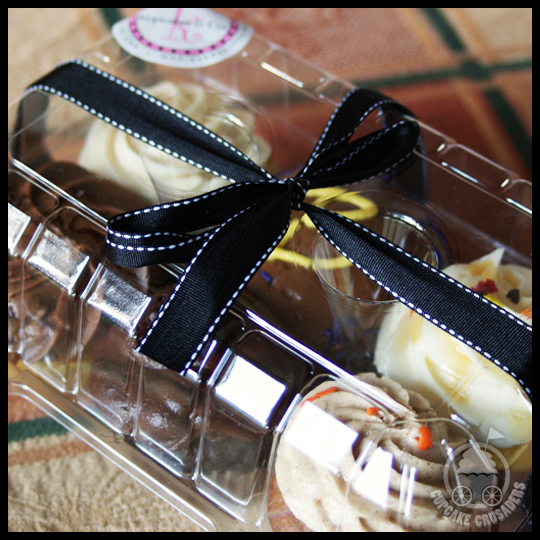 The cupcakes are a normal size and have a home-baked feel to them, which is comforting and goes perfectly with the warmth of the café. After tasting the cupcakes, seeing how nice the venue is, and checking out the breakfast and lunch menu, I can’t believe I waited so long to try them out. 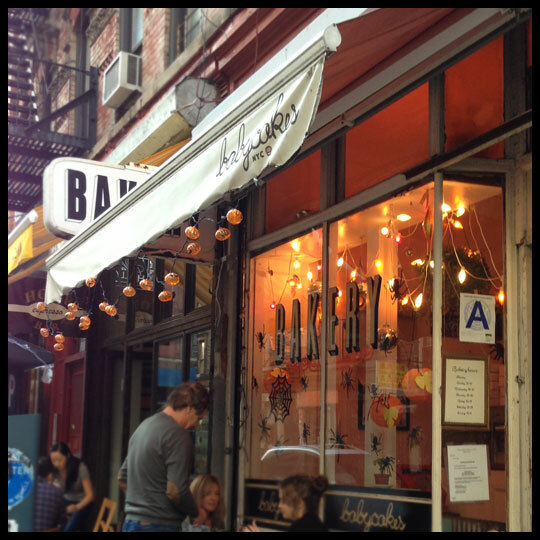 I’m looking forward to going back when I can sit with friends and enjoy a full meal, with cupcakes for dessert.